Time Magazine featured Raymond Loewy, designer of the Avanti for Studebaker (in 1962), on its October 31, 1949 cover. Loewy's influence was revisited by Time in March 2000 - "When industries are competing at equal price and functionality, design is the only differential that matters," was the credo first spouted in the '30s by Raymond Loewy, father of industrial design. Loewy was the man who gave America the Lucky Strike cigarette pack and the sleek Greyhound bus, and when he added a flourish to the Coldspot refrigerator, to make it look just a little more streamlined than its 1934 competitors, sales at the department store Sears skyrocketed. Good design married commerce during the Great Depression, and Loewy's career took off then because he made products irresistible at a time when nobody really wanted to buy anything." 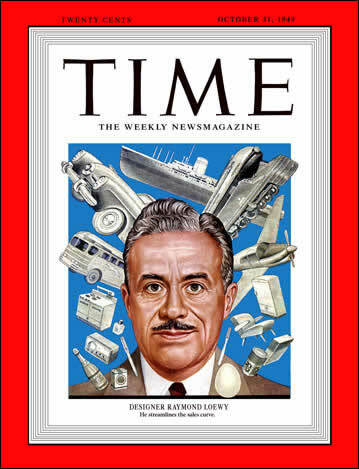 Designer Raymond Loewy on the 1949 Time cover surrounded by industrial products and the egg. 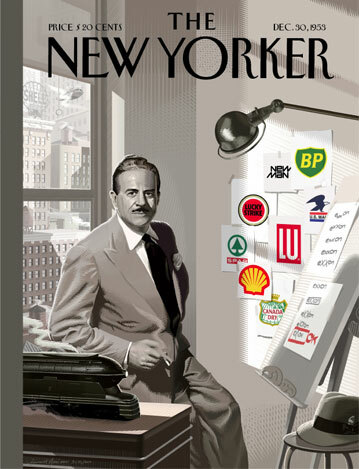 Fantasy New Yorker cover by Belgian illustrator Laurent Durieux spotlighting Loewy's logo designs. Designer Raymond Loewy photographed in the 1930s in a prototype office of the future.